Are you a social knitter? Or do you just need some knitting advice and support? 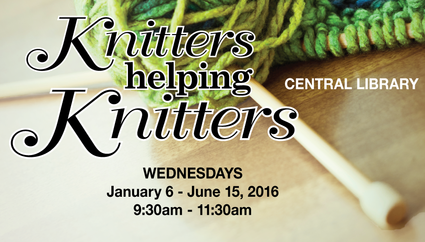 On January 6, another session of our popular "Knitters Helping Knitters" group starts and will run every week until June 15 at the Central Library. Everyone loves singing around a campfire. Join us around our imaginary campfire and sing along to all the old favourites. Bring your own instrument if you like, and songs to share. Drop in. No registration required.